noki ayame 軒あやめ（のきあやめ）iris under the eaves"
ichihatsu 鳶尾草 (いちはつ) Ichihatsu iris, "wall iris"
. Blue Flag (kakitsubata 杜若) . sekishoo 石菖 (せきしょう) "stone iris"
There are many more words in Japanese to differentiate between the many kinds of iris that flower mostly during the rainy season, giving a special elegance to an otherwise dreary season. In Japan, there are many famous Iris Parks and Iris fields, which I will introduce below. Itako Town in Ibaraki Prefecture lies beside the river Tonegawa. During the Edo period (1603-1868) it flourished as a relay port for the shipment of cargo from the north of Japan by water to the nation's capital, Edo. The beautiful scenery on the waterfront was much admired by writers and artists, many of whom visited the town. 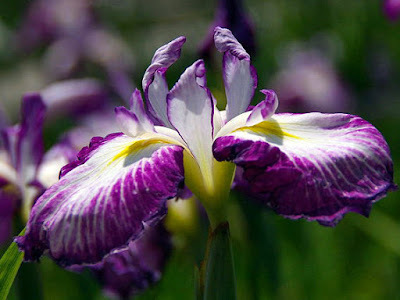 Today, the Ayame (iris) Festival in June is the biggest tourist attraction. Along the sides of the river iris flower park has been set up, and as the season approaches, as many as one million individual plants of around 500 colorful varieties come into bloom in purple, white and yellow. During the festival season every year the town attracts about half a million visitors. Boatmen ply the waters in rowboats, taking sightseers on trips redolent of the past. If you are lucky, you might be able to see a beautiful bride going out to meet her bridegroom on one of these boats. Have a look at some pictures of the area too. Meiji Shrine in Tokyo is famous for its splendid Iris Garden, which was designed by the Emperor Meiji himself. People take joy in painting and making haiku about these plants. More photos of the many Iris Festivals (ayame matsuri) in many areas of Japan. Mizumoto Park, Horikiri Park and more in Ibaragi Prefecture. Look at an Iris Garden in Yokosuka, Japan. 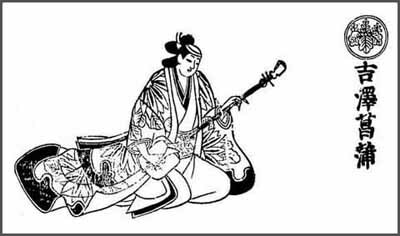 was an early Kabuki actor, and the most celebrated onnagata (specialist in female roles) of his time. 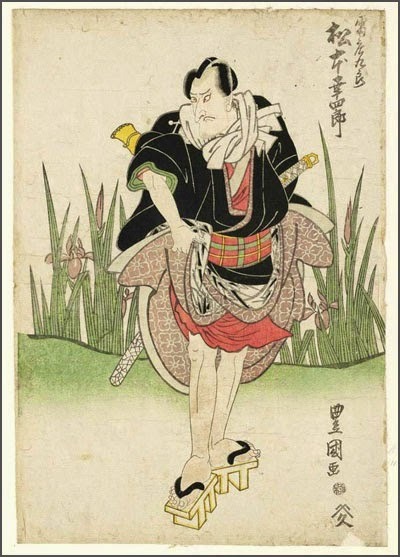 His thoughts on acting, and on onnagata acting in particular, are recorded in Ayamegusa (菖蒲草, "The Words of Ayame"), one section of the famous treatise on Kabuki acting, Yakusha Rongo (役者論語, "The Actors' Analects").
. . . Ayame is famous for advocating that onnagata behave as women in all their interactions, both onstage and off. In Ayamegusa, he is quoted as saying that "if [an actor] does not live his normal life as if he was a woman, it will not be possible for him to be called a skillful onnagata."
. . . Though most commonly known as Ayame, Yoshizawa took on the stage names of Yoshizawa Kikunojō during a brief stint performing in Edo, and Yoshizawa Gonshichi when performing as a tachiyaku (in male roles). He also used the name "Gonshichi" as a nickname (替名, kaena) used when patronizing a brothel or restaurant. His haimyō (俳名, poetry name) was Shunsui, and his guild name (家名, kamei) Tachibanaya, after his mentor Tachibana Gorozaemon. 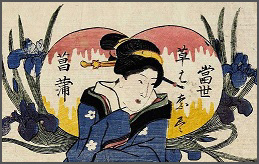 ayame　あやめ was a way to call the cheaper prostitutes at the hatago hostels along the various kaido-roads of the Edo period. Most came from poor farming families, had to do hard work in the hostels and died at a young age.
. prostitutes flowering in Yotsuya and Shinjuku, Edo . In 1689 Matsuo Basho (松尾芭蕉) crossed the Natori River and entered Sendai, Miyagi on ‘ The Narrow Road to Oku.’ It was the day they celebrate by converting their roofs with ‘Sweet flags’, or Calami’ (あやめ). He visited there around the time of the Sweet Flags Festival (あやめの節句)(5th day of Fifth Month, also called the Boy’s Festival), when sweet flags were displayed on the eaves of houses to drive away evil spirits, or they took “Shobuyu, or 菖蒲湯 (bath with floating sweet flag leaves)” baths. The leaves keep mosquitoes and snakes away with strong fragrance. As the strong fragrance was believed to drive away bad air, people began to take baths with sweet flag leaves. Furthermore, the plant ‘Sweet Flag’ was believed to be a symbol of the samurai’s bravery because of its sharp sword-like leaves. Even now many families with young boys enjoy “Sweet Flag Bath(shobu yu)” in the Boy’s Festival on May 5. 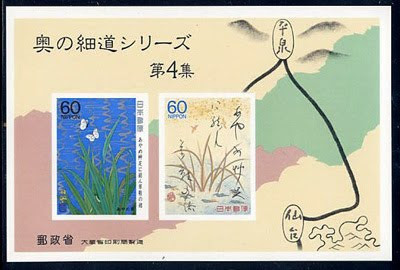 CLICK to see more stamps from Oku no Hosomichi. Basho on his way from Sendai to Hiraizumi.
. the Matsuo Basho Archives 松尾芭蕉 . umbrella for rain and shine . 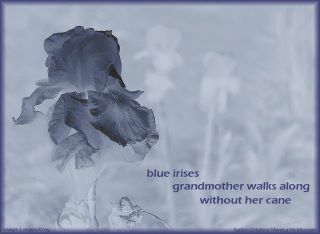 In the archives of Shiki you find a collection of haiku about iris from 99. "Child of the Swallow", because the form of the flower looks like a baby swallow starting its first flight. 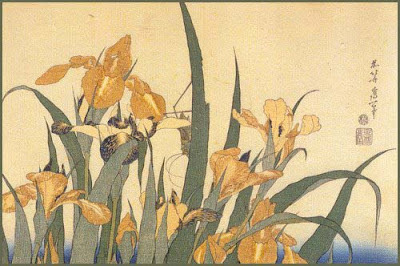 The night before the annual Boy's Festival (fifth day, Fifth Month), eaves of houses were thatched with grafts of blooming irises; Kiyose (Tokyo: Kakugawa Shoten, 1984) 122. The return of the swallows coincides with the human celebration. 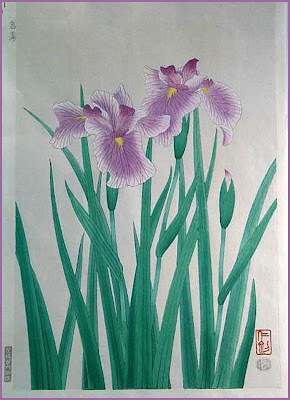 The long leaves of the iris (shoobu) reminded the samurai of their swords. The word SHOOBU　勝負 also means a fight, usually to the death. ***** . seasonal festival of the iris . The Boy's Festival on the fifth day of the fifth lunar month, now May 5.
neji ayame 捩菖蒲 (ねじあやめ) "twisted iris"
Grows to about 1 m long. Originated in China, with twisted leaves and light purple flowers. The first use of the word "iris" in French is in a 13th c. manuscript, Le Livre des Medecines Simples, where it says: "iris porte roge flor et ireos blanches." The word existed before, to name a prism, or rock through which the light diffracts into a rainbow (here the etymology is clear: Iris, messenger of the Gods). How it came to designate the plant I don't know (ref: Godefroy: Dictionnaire de l'Ancienne Langue Francaise, vol. 10, Kraus reprints, 1969). The first instance of the word "lis", plural of an unattested "lil" from Latin lilium, is around 1150 for the flower. The word is often found as metonymy for the lily flower, and used in numerous metaphors for whiteness, purity, etc. For example, in Erec et Enéide by Chrestien de Troyes (ca. 1170): "plus ot que n'est la flor de lis, Cler et blanc le front et le vis" (forehead and face pale and white more than the lily flower) (example taken from: Tobler-Lommatzsch: Altfranzösisches Wörterbuch). The word fleur de lis is also used as metaphor for the Virgin Mary (1223). First clear-cut use of the word "fleur de lis" in its heraldic acception is in 1225 in Durmart le Gallois, although Victor Gay (Glossaire Archéologique du Moyen-Âge, vol. 1, Paris, 1887) claims that the word is used in an ordnance of Louis VII (1137-1180), without giving any reference. What is really strange is that the lily was such a constant metaphor for whiteness, and would become a golden charge. As mentioned before, lilies are usually white, not yellow. By the way, let me tell you about those three kinds of Japanese iris and another kind of plant called “iris” in the ancient times of Japan. The 1st kind of iris is the Hanashobu （ハナショウブ, 花菖蒲, Iris ensata var）, growing in the wet land. It is the most extensively cultivated variety in Japanese gardens. 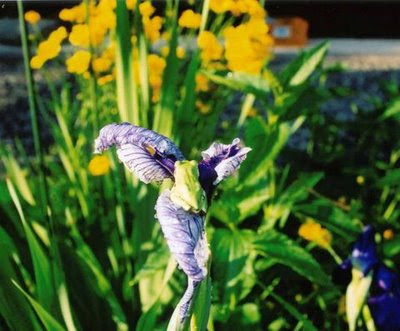 The 2nd kind of iris is the Kakitsubata (カキツバタ, 杜若, Iris laevigata), growing in the semi-wet land. It is less popular, but is also cultivated extensively. The 3rd kind of iris is the Ayame. (アヤメ, 菖蒲, 文目, Iris sanguinea) typically growing wild on the dry land in Japan. The 4th plant doesn’t belong to the kind of iris but is called ‘Shobu’ (ショウブ、菖蒲) in Japanese, or ‘Ayame’ ( あやめ), or ‘Ayamegusa’ ( あやめ草) in the old Japanese terms. This is a plant called ‘Sweet flag’ belonging to the Acoraceae family, Calamus, and known for its fragrant roots, rather than its flowers. The 1st kind of iris, Hanashobu are wonderful garden plants. 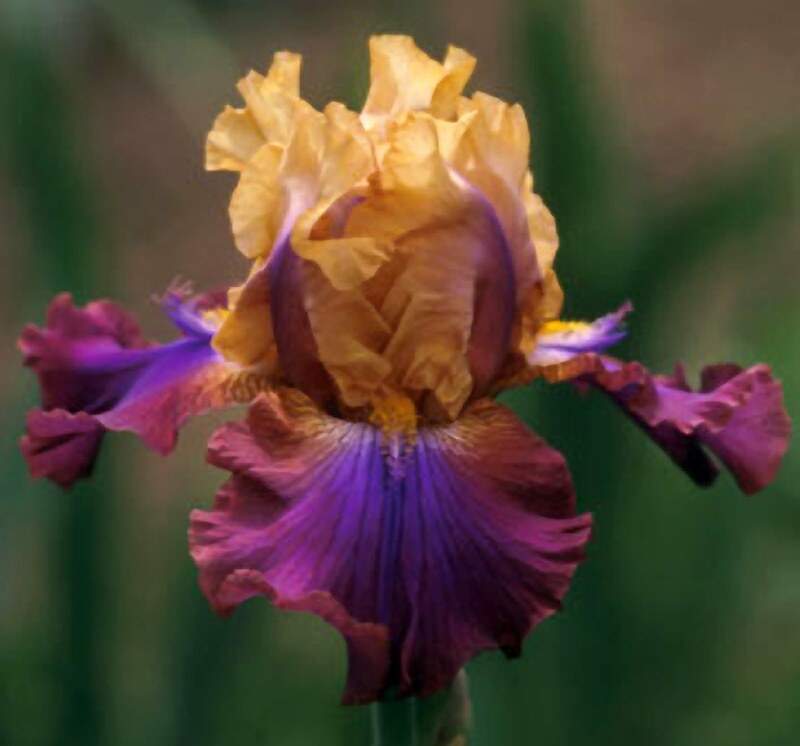 As the word Iris means rainbow, irises come in so many colors: blues and purples, whites and yellows, pinks and oranges, browns and reds, and even blacks. The genus Iris has about 200 species and is native of North Temperate regions of the world. like actor Motome . . . This hokku is from lunar 5/5 (June 21) in 1806, when Issa was in the area to the east of Edo on a trip to visit some students. It seems to refer to the evening of 5/4, when preparations for the big 5/5 Tango children's festival began with people placing bunches of long, blade-like sweet flag leaves on their eaves, often tied together with mugwort leaves. Both of these herbs were believed to purify the house and its inhabitants and protect them at the start of the summer epidemic season, as was a bath taken the next day in which sweet flag leaves had been soaking. 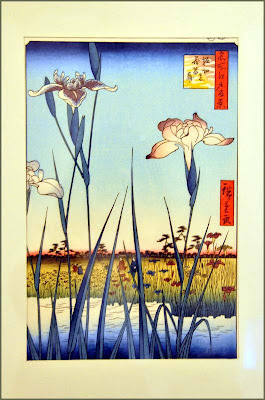 Sweet flag or calamus (shoubu) is a wetland plant that grows at the edge bodies of water, and it is often confused with Japanese irises (hana-shoubu), a different plant. Sweet flag has no flower petals like the iris but only a spadix or spike shaped like a small corn cob that puts out tiny green flowers. Sweet flag is loved, however, for its leaves, its attractive lemon-like scent, and its many medicinal qualities, which are probably the reason it was used to purify houses and is still used in healthful sweet flag baths. Presumably Issa is staying at a home where the the fragrant sweet flag and mugwort hang down from the eaves, and they all go to bed early, since tomorrow is a big festival day. The last thing he can remember seems to be the scent. There may also be the suggestion that the visit went well and communication went on at just the right pace. children bathed in hot water steeped with iris leaves. This was thought to fend off sickness and disease. Girls could participate as guests of their brothers. This hokku is a version of a poem from the Kokin Shu 古今集 collection, by an unknown author. Basho has only changed the gogatsu to goshaku. Horikiri district 掘切 "digging a canal"
The district is most famous for 堀切菖蒲園 its Iris Park.
. Horikiri Shōbu 掘切菖蒲 .